Just like last month’s retro release Captain Midnight, Brain Boy is another forgotten vintage comic book given the 21st century make over by the guys at Dark Horse Comics. Matt Price is a psychic super agent who works under the auspices of Albright Industries (sound familliar Captain Midnight fans?) 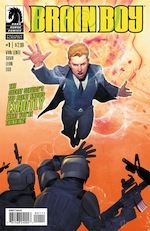 Part super-hero and part super-spy, Brain Boy is James Bond meets Jean Grey and in this roller-coaster first issue his skills are severely tested when he is loaned out to the CIA to guard a sleazy South American General with a Christ complex. With it’s cyclical story from the brilliant Fred Van Lente, it’s twisting political intrigues mixedwith a generous dose of action and the odd bit of supernaturalism along the way, means Brain Boy is a total mish-mash of styles but it absolutely works and is completely awesome. With it’s explosive finale this is one book that really exceeded expectations and we can’t wait for issue #2 – in the mean time, just don’t call him Brain Boy! Getting comedy right in comics is a difficult knack, but it’s one that writer James Asmus manages to perfection in Valiant’s Quantum and Woody. Adopted brothers Eric and Woody Henderson investigate their fathers mysterious death only to be caught up in an explosion at his lab that has extraordinary consequences for both men. With a set-up like that the book could degenerate into ‘superhero cliche 101′, but thanks to Asmus’ smart script, his bickering heroes and love of a quick. quip, means it’s much more than ‘just another superhero book’. 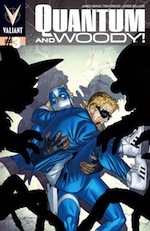 Ably supported by artist Tom Folwer who gives the book the perfect balance of serious superhero action and cartoony comedy quirks, Quantum and Woody is a truly under-rated gem of a comic and real delight to read every month. And we haven’t even got to the goat yet!! 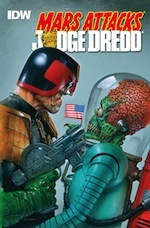 Another book that treads that difficult line between comedy and drama is Mars Attacks Judge Dredd. IDW continue their Mars Attacks themed mash-up books with this latest offering that pits the acking aliens against Mega City One’s unflinching instrument of the law. Dredd is the perfect straight man for the goofy Martians and thanks to a solid script from 2000AD veteran Pat Ewing and artist John McCrea it never degenerates into complete farce. Keeping Dredd’s core values of unrelenting justice in the face of a goofy Martian invasion is nothing new, in fac, 2000AD itself has often walked that line of comedy and drama over the years, so putting Dredd in this situation isn’t completely out of character – Walter the Wobot anyone?! With a writer and artist who know the character as well as Ewing and McCrea then you know you are in safe hands, and although it may lack some of the yucks we’ve seen in previous Martian mash ups, this is definitely a pairing that has more potential than a one trick joke. Resurrected from the 2000AD vaults, Pat Mills and Kevin O’Neill’s science fiction/supernatural/alien class struggle allegory gets a well deserved digital reprint this week and reminds you just how exciting the UK comics scenes was in the 1980s. Although not as iconic as 2000AD‘s big names like Judge Dredd or Rogue Trooper, the anti hero Nemesis is just as important a character in the history of the galaxy’s Greatest comic and has at its core one of comics great villains – Torquemada the Terminiator. Nemesis is an alien freedom fighter and warlock who is trying to prevent the galaxy from being destroyed by the genocidal humans lead by the tyrannical Torquemada and. Part Klu Klux Klan grand wizard and part demonic church leader, Torquemada is a vile and snarling uber-villain from the very darkest depths of the human soul and so is delightfully dastardly and thoroughly unlikeable. Mill’s scripts range from straight sci-fi to medieval feudal politics to giant robots punching each other while O’Neill’s increasingly surreal art is allowed to run riot across the page creating a truly unique looking book. The series ended when O’Neill moved to the US but the pair would reunite to work on Marshall Law for DC in the 1990s, however their work was never as fresh and dynamic as it was in Nemesis. This new Deviant Edition reprints the first two coloured editions of Nemesis that were reprinted by Eagle Comics and features the bonus story of the Tomb of Torquemada. 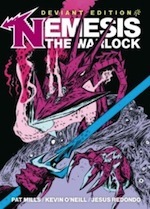 The ‘Deviant edition’ of Nemesis the Warlock is available from Amazon.co.uk and the 2000 AD webshop now. « Sunday Digest 08/09/13 – this weekend’s must-read digital comics	» News: 2000ad launches Prog 1850, Judge Dredd Day of Action campaign, plus comic book movie sequel hits Apple Newsstand!